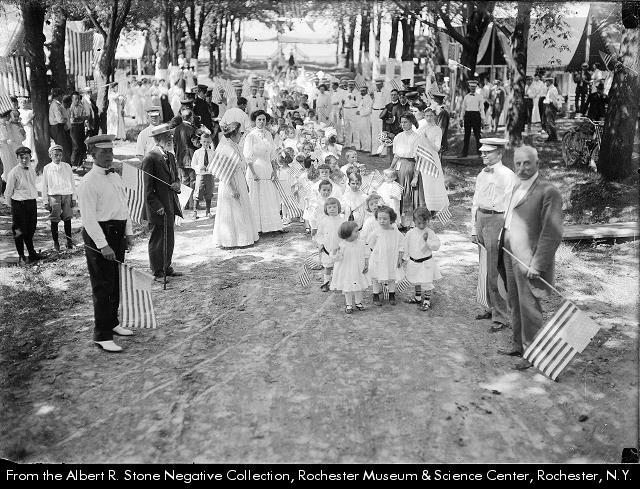 A procession begins in White City, in the summer of 1909. We speed through the spaces of our lives as quickly as we can – rushing through the city, rushing to the mall, rushing 20 or 30 miles without blinking an eye. We have to, after all – we have spread out all over the place. But stop rushing for just a minute. Think with me about how changes in our perceptions of time, speed, and distance have radically altered this urban place we call home. Sooner and faster and further have wrecked us. 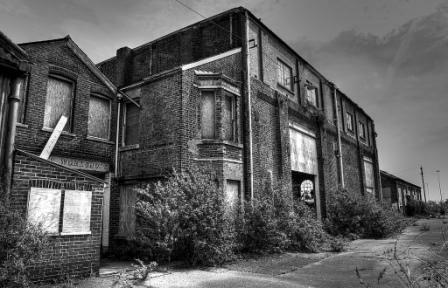 Our cities are increasingly empty ruins. The countryside is filled with what’s left. None of this is good, none of this is our future, none of this is sustainable. 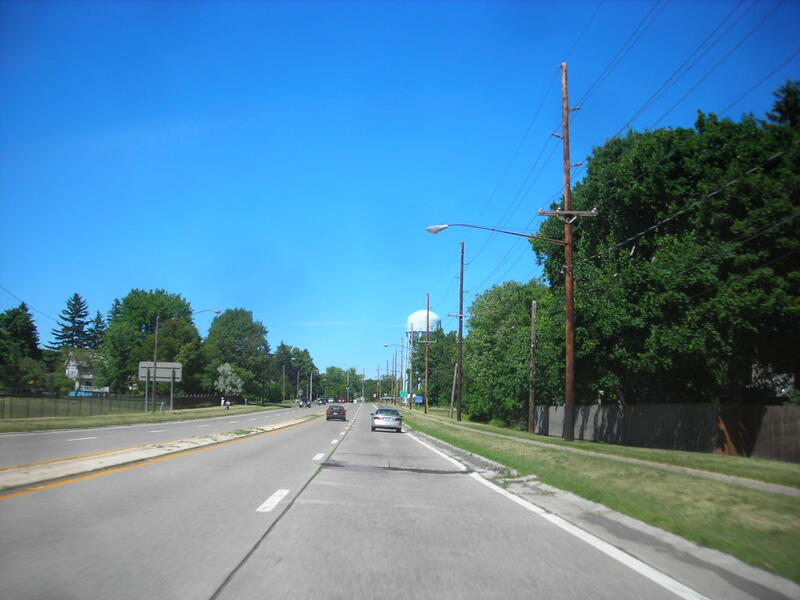 In Rochester, this shift in our perceptions of space and pace, and the physical places that are a result, has led to what I call the 40 mile life: 20 minutes in any direction, on an expressway, is the diameter of our daily existence. We all lead 40 mile lives. O, to lead a 4 mile life! But the 40 mile life wasn’t always so, and it shouldn’t be so today. I want to explore a special place in our city, because I think this place can teach us lessons about our perceptions and our cities, lessons that we need to learn, or should I say relearn. Take a moment, please. 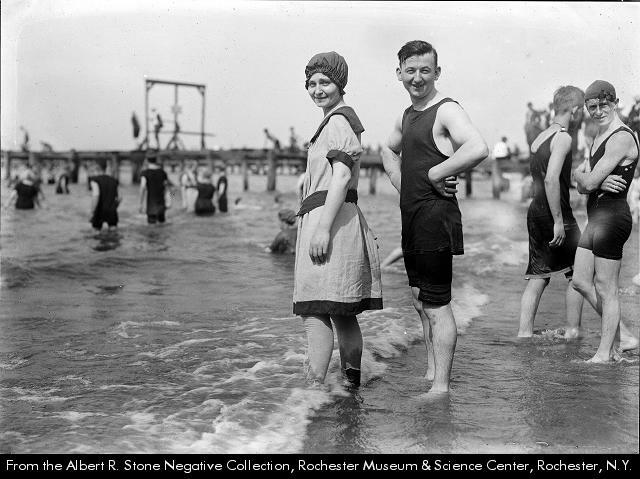 In those days, the lakeshore was a distant 8 miles or so from downtown Rochester – about a three-hour walk. The city then was much more dense than today – at least twice as dense, and occupied much less land than the city today – about a third less. 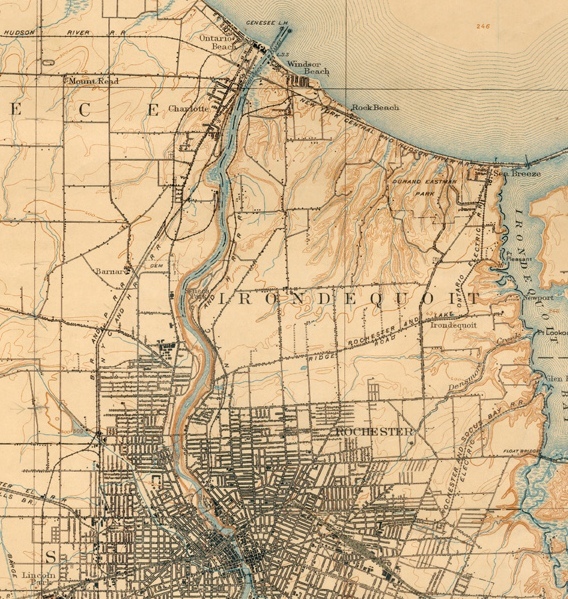 As the map will show you, there was a six mile gap between the most northerly street of the city, then Norton Street, and the beaches at the lake. Take a closer look. 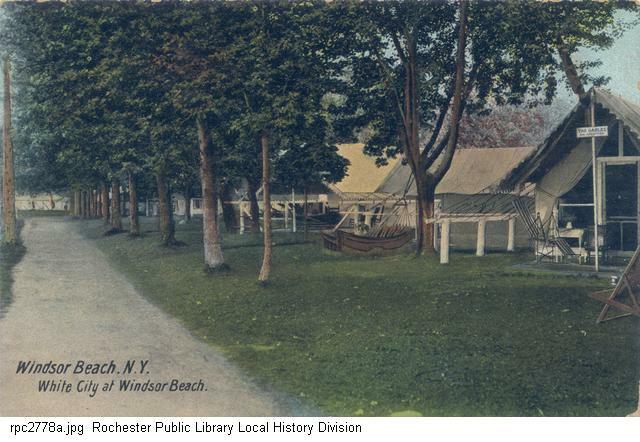 Those rows of buildings along the tiny streets at Windsor beach? A canvas city, and thus a White City. And in the gap between the city and the lake? Farms. One of the city’s breadbaskets. During the fall and winter and spring, you lived in the city. In your neighborhood. In 1910 or so, it’s pretty unlikely that you had a car. A bike, perhaps, or a horse and wagon. But the scale of this mobility, and the pace of this mobility, guaranteed that you led a local life. 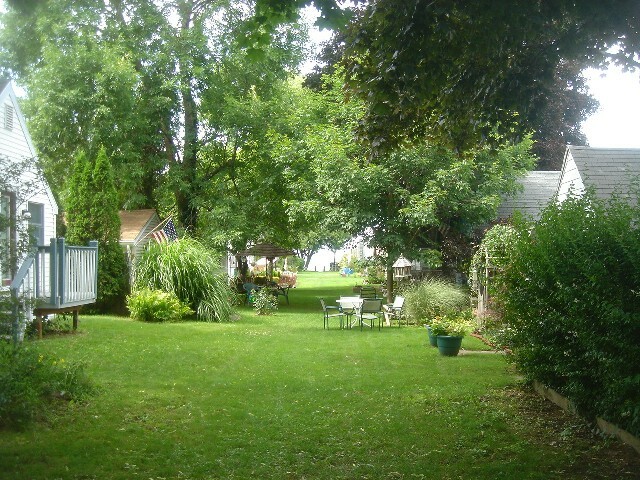 Close to neighbors, close to work, close to the market, the schools, the churches. A local life. Let’s say a 4 mile life. In the summer, it was time to get out of the city so you could enjoy the nature of the city’s wonderful larger setting, the good weather, and your friends and family. So you used the only means it was likely you had – the streetcar – and you headed to the lakeshore, and White City. 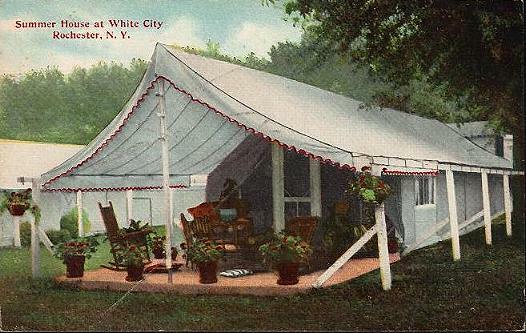 White City was filled with tiny shotgun cottages, with roofs of canvas. 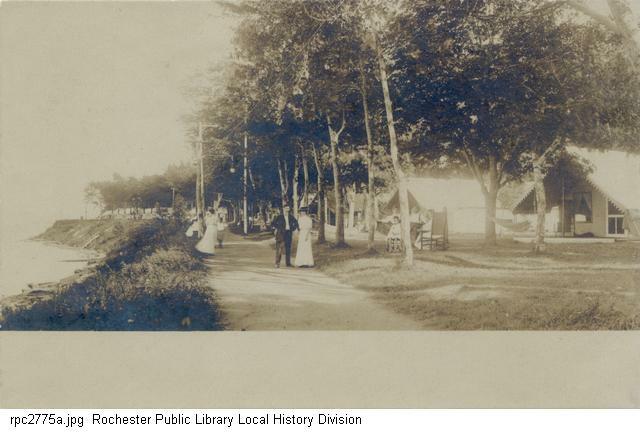 In reality, the tent cottages were quite dense on the six or so lanes they occupied. It was, in fact, like being at camp. Maybe the family left at the end of school in June, and Dad commuted by streetcar from the city on weekends. Or maybe you just came out for a couple of times a summer for a week or two to enjoy the water and the solace of family and friends. 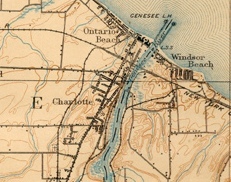 Near Windsor Beach was a range of resort hotels – eleven in all. 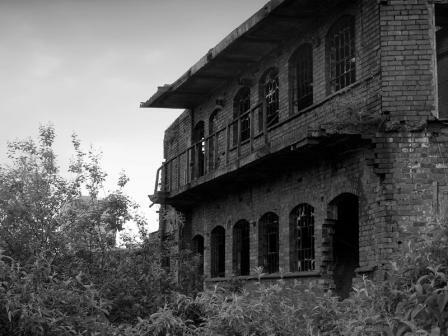 By the middle of the 20th century they were all gone – most burned to the ground for one reason or another. But while they were there, there were fun times…. Resort hotels bloomed in these times. 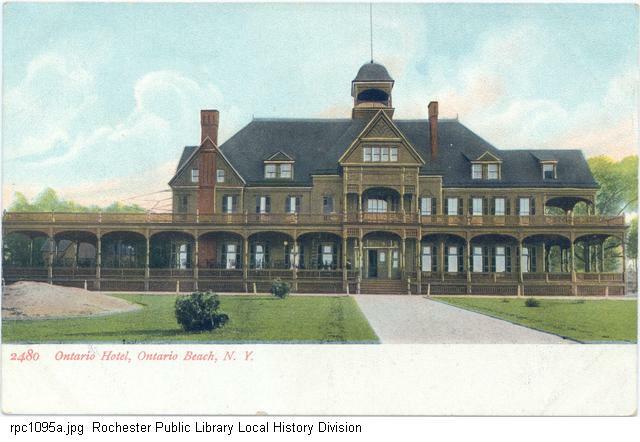 Here is the massive Hotel Ontario. And here the more intimate Hotel Windsor. Everybody is hanging out on the porch. Or the Hotel Bartholmay – a giant resort complex. 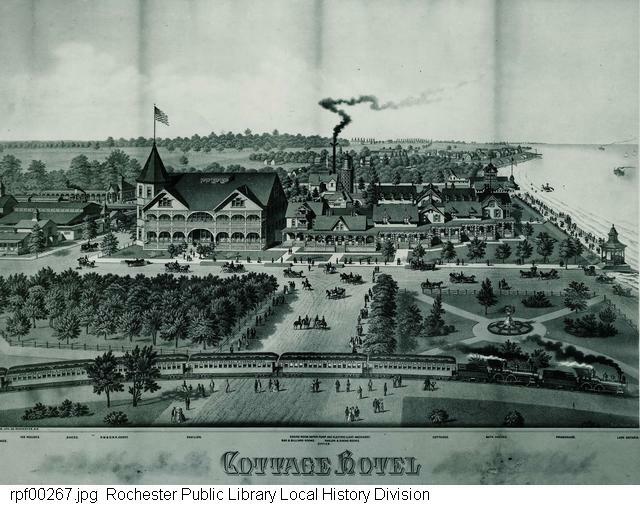 This is a view from 1888 – this business of going to the lakeshore went on for quite a while. Please do note the trains. In 1910, how did you get out there? One guess – streetcars. And even when the weather turned its back on vacations. 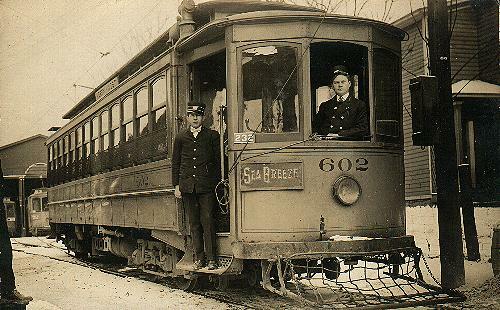 Interestingly, the street car companies were the real heavy lifters of this story – they paid, for example, for all the electricity and water at all the hotels and resorts. All aboard! 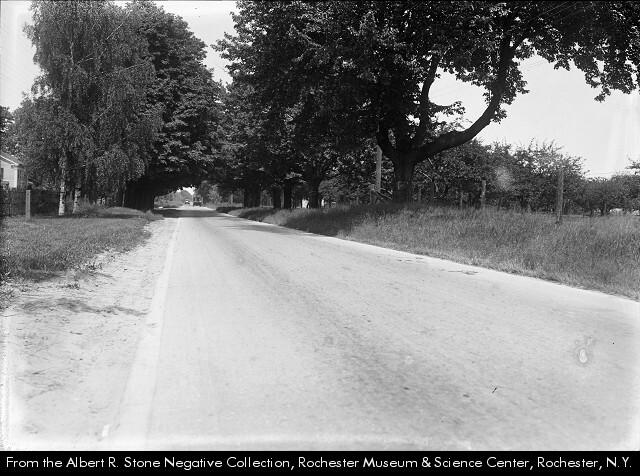 If you were fortunate to own an early car, you could drive north on Culver Road to the beach. 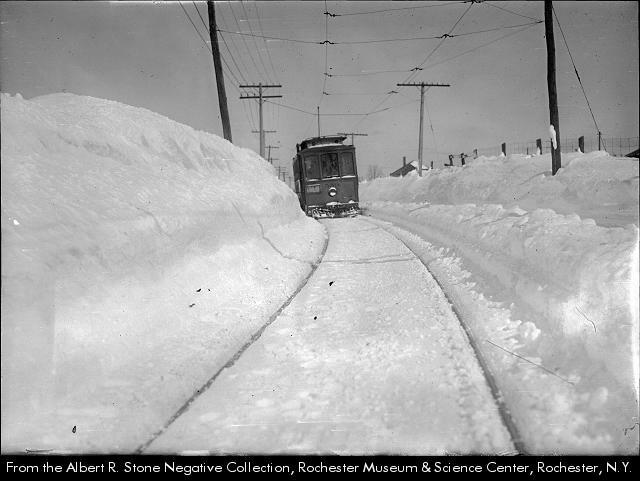 The road, in 1917, looked like this. Orchards on the left, farms on the right. Pretty nice drive, I guess. And today, the view on the road to Sea Breeze looks like this. Ah, the 40 mile life. Better, right? Progress, right? And White City today looks like this, at a point very, very near where Albert Stone took that picture of the procession of children in 1909. Yes, the tents became cottages, the cottages homes. Go and take a stroll there if you can, and capture the slower sense of time and speed and distance that once made a city a city, and a vacation a vacation, year after year, summer after summer. We need again to find local lives – 4 mile lives. We need to transfer our mobility from our cars to something else – like streetcars for example. And we need to take the time to see our home places building by building, block by block, in the best way possible – on foot. The stories of our lives, and the lives that came before us, are impossible to discern at 40 miles an hour. But if we slow down a bit, the things we see can astound us. Our future is close at hand – go for a walk. Since we began posting here at A Town Square, in November of 2007, it has always been with an eye to using the blog as a research and development platform for a book, or something like a book. Who knows – maybe an HBO mini-series. 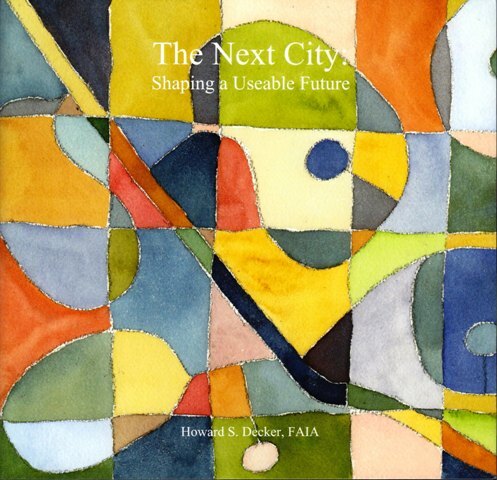 The book, with a working title of The Next City: Shaping a Useable Future, may or may not ever see the light of day. But the premise for the effort is simple – the cities we live in are obsolete, and simply cannot meet the challenges of what lies ahead. We can understand these challenges in economic terms, or environmental terms, or in terms of over-population, or in terms of shortages of jobs, water, energy, food, money. But our cities, the real engines of all nations, are obsolete. And we need to reinvent them at the speed of light. So all the while I have been posting here, I have been doing so with the book’s table of contents in mind. And now I have collected something like 40 posts, put them in chapters, and self-published them as a 180 page book, which you can see at www.blurb.com. 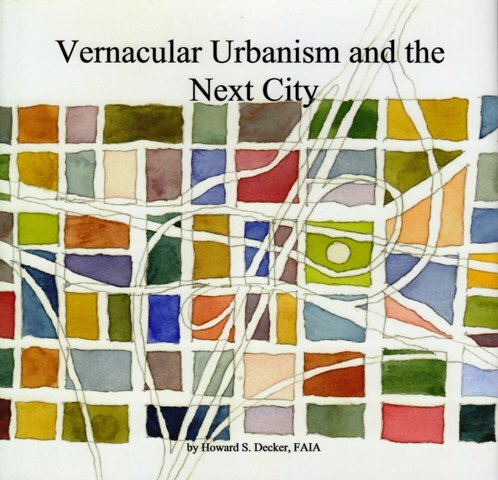 I have also collected the four posts on vernacular urbanism and put them in a slim 32 page volume, also at www.blurb.com. So if you’d like, you can go there, type in the book titles, and take a look. And tell me what you think. Remember, as good friend Larry correctly observed recently, these are books about books. Tools. Means, not ends. The real work lies ahead. Me? I’m going fishing now, for a publisher. “Once we accept that our cities will not be like the cities of the past, it will become possible to see what they might become.” Witold Rybczynski, City Life. 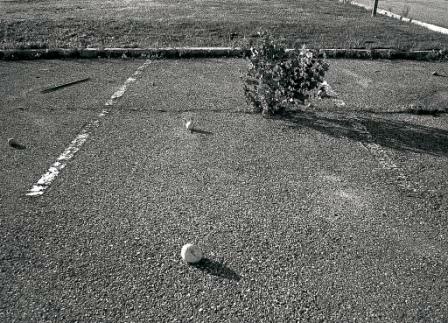 When he wrote those words in 1995, Rybczynski was actually “glimpsing the urban future,” and seeing it as a low-density and low-rise city, amorphous and sprawling, completely reliant on the car, decentralized. And, sadly, that is the city we live in today. But in another way, Rybczynski was right. The city of the recent past, the 20th century auto dominated sprawling city, whose infrastructure alone we can no longer afford to maintain, is a failure, and obsolete. We must accept this, as he suggests. In fact, our cities and the way we inhabit them must now give way to an alternate vision: now we can begin to see what they must become. The existing American city is one stupendous shovel-ready project. The oft stated goals are obvious: we need to inhabit a next city that we can sustain, and that can sustain us. A durable, useable city that we can afford, a city that actually works to heal the long list of messes we have made. A city that is based on energy we can generate locally, food that doesn’t come from a factory, or a semi, water from a well that won’t run dry, a city in which we no longer need a car for mobility and access to all of our needs. These are the basics, and are pretty easy to see as foundations. But what may be most interesting about the shovel-readiness of the next city is the fact that it can all be done locally, neighborhood by neighborhood. The next city can be particular, circumstantial, based on what’s at hand, incremental. Based on systems of decentralized and locally installed elements of infrastructure, the next city could emerge block by block. On our block of 59 rowhouses here in D.C., we could rip up the alley in our post-car, or shared-car, city and we could install a central heating, power and cooling plant there. And maybe a large solar array for all of us. We can gather all of our water, classify it, treat it, and reuse it on our own block. We can rip up a few of our defining streets and build some new buildings there, yielding an increase in mixed-use density for shops, offices, and homes, with room left over for garden plots and markets. Across every city, we can reuse and reprogram and revise. We can renew and reinvent based on the rich array of found conditions available everywhere. Some call this micro-urbanism: a new market under the raised expressway, a town square in an old highway cloverleaf, gardens in old parking lots, malls converted to neighborhoods, parking garages as lofts. And we can recycle all the existing structures we can find, conserving both their narratives, and all the energy they already embody. They’re all shovel-ready. Taking this approach to urbanism seems like a much better investment, and a stimulus to the economy and our urbanism, than new highway off-ramps. I guess what we need now, in order to see how possible this is to achieve, is a demonstration block. Somewhere where we could try things, discover the problems and pitfalls, find the right technologies and uses, and do so while everybody watches, and learns, as a new kind of community, and city, unfolds. Time to get the new Urban Policy Czar on this – it’s shovel ready, after all. And what better place to demonstrate the next city than right here in the nation’s Capitol. 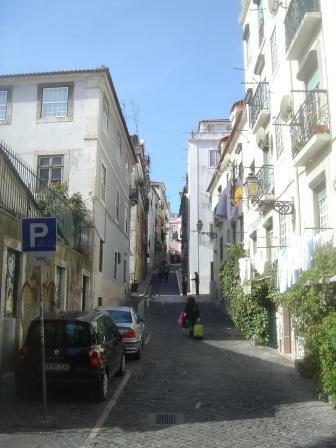 Lisbon, Cadiz, Casablanca – some of our recent destinations. In each of these cities there is at least one district, or urban quarter, that is dense, rich, bustling with activity, alive, completely walkable, and as ever, fragile. Each faces pressure from gentrification, adjacent development, cars. 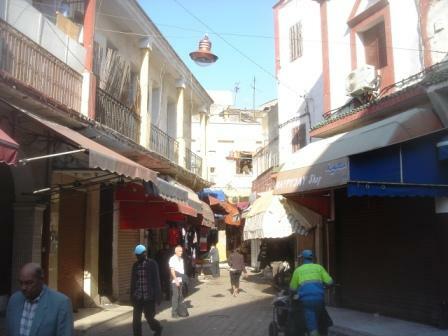 (Only the Old Medina is so dense that cars are excluded, because they just don’t fit). 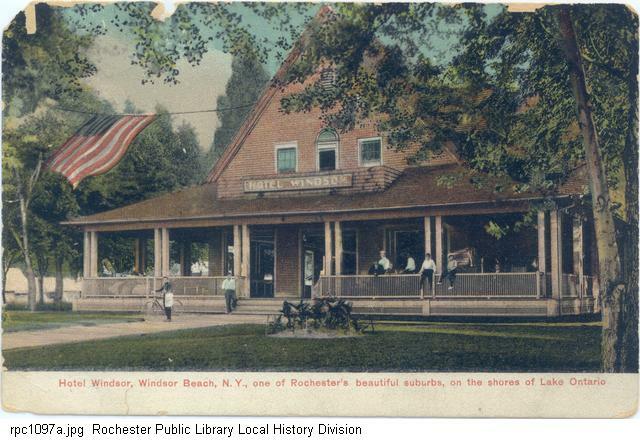 We were interested to examine how each is unique, particular to its locale, and could be said to be a strong example of a kind of vernacular urbanism as each has evolved over time. Even today each seems to accomodate changing use within it’s urban fabric with grace, and without losing either physical and urban, or social and cultural identity. Here are the three quarters. Bairro Alto in Lisbon, from 4,000 feet. 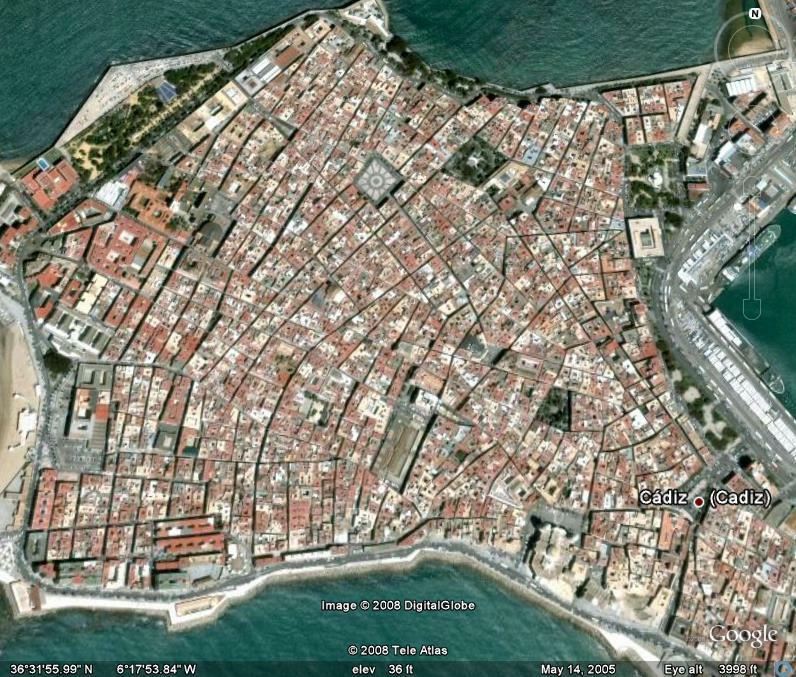 The Old City, Cadiz, from 4,000 feet. 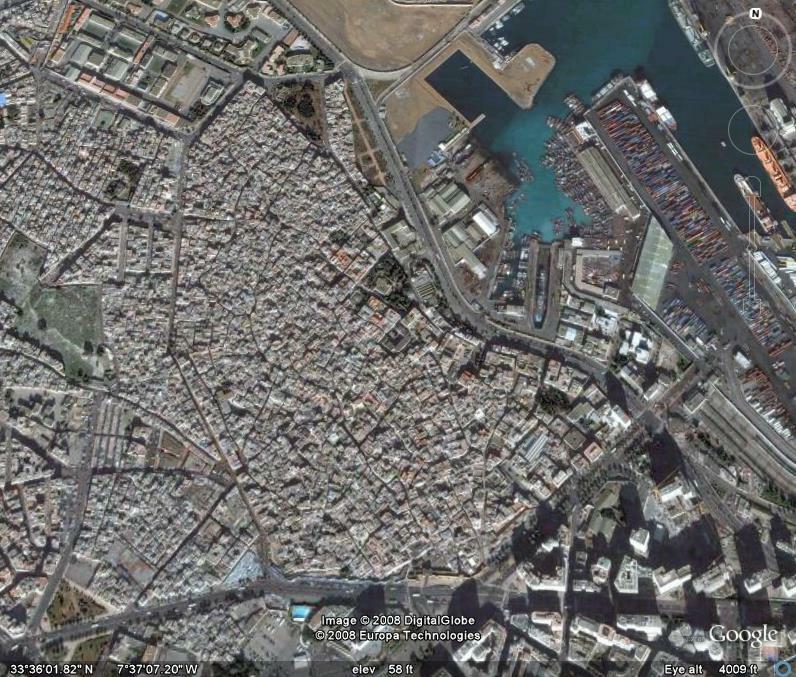 The Old Medina, Casablanca, from 4,000 feet. There is a fineness of grain and texture, and an intimacy in scale, to each quarter that is easy to perceive from the air. 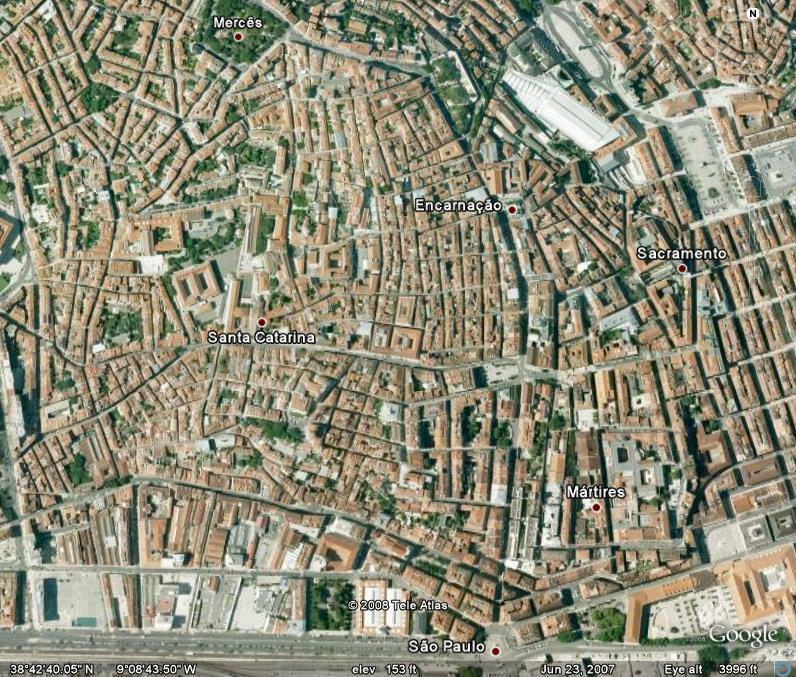 Also easy to perceive is the density of each – these urban quarters are both compact, and packed. Clearly each of these places was created by and for people on foot – most streets in each are narrow enough to reach across in the span of your arms. On the ground, the quarters are each marked by an enormous mix of uses in very close proximity. Here is a view of each from the ground. 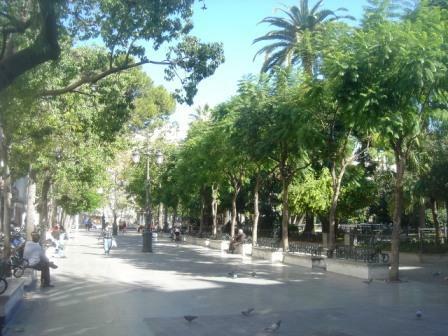 Plaza de Mina, Old Cadiz. Consistent with our observations in other posts examining the notion of vernacular urbanism, each of these quarters qualifies: each is instinctive, incremental, complex, and very local in character, form and material. Our neighborhood exists at a density of about 30 dwelling units per acre. By way of comparison, Old Cadiz is at least 4 or 5 times more dense. If you set out for a walk in our neighborhood (as we do every day), and you were off to the local supermarket or hardware store say, you would walk about a mile to get there. Over half a mile to the local public market, or nearly that to get to the train station. If you walked for about a mile in Cadiz, or Bairro Alto, or the Old Medina, you’d be gone – you’d be well out of each of those quarters. Said in a slightly different way, vernacular urbanism is about density of population, but also about density of use. And if the next city is to offer us a durable, sustainable home, it too will have to be intensely walkable, very dense with inhabitants, and similarly loaded with a dense mixture of uses. “All cities are mad: but the madness is gallant. 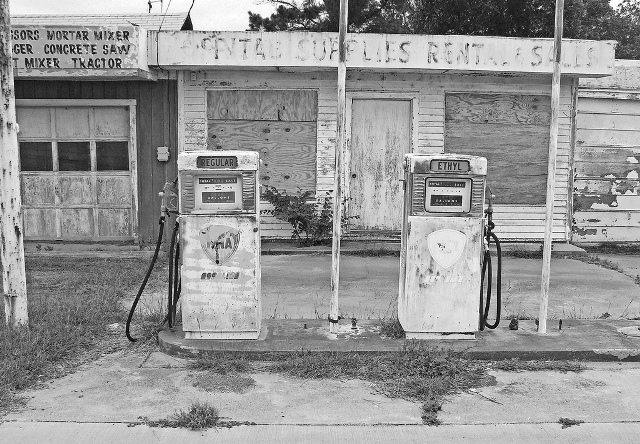 All cities are beautiful: but the beauty is grim.” Christopher Morley, Where the Blue Begins. I continue to search for a vernacular urbanism for the next city. After some reflection, I have concluded that what I am looking for is an urbanism that is local in character, conditional, circumstantial, meaningful and of value (in every sense – not just financially) for its inhabitants, rooted to its surroundings and its past, an urbanism that is founded on local resources and the specific nature of a particular place, that is based on the found and the available and the renewable. And so I have found myself thinking about slums. Let me explain. Today one half of the earth’s population lives in cities. That means that something more than 3 billion of us are city dwellers. Of that 3 billion in cities, one third of all city dwellers lives in a slum. Many sources put the world slum dwelling population at something near or over 1 billion people. The UN, among others, tells us that by 2030, one third of the population of the planet will live in slums. This is powerful data, and calls us to look at these places, and learn what we can. Barrio, favela, shanty town, ghetto, squatter city, wasti in India, katchi abadi in Pakistan, refugee camp, the slum has many names, and many faces. They share some things in common, wherever they may be: they are always home to the very poor, the displaced and the outcast; they all feature substantial problems with sanitation, health, crime, education; they are fragile, and often the shelter they offer is insufficient for local climates; they are crowded, and very dense; they are not subject to romance or nostlagia of any kind – they are very hard places to live in in every way. A favela in Morumbi, in Sao Paolo. 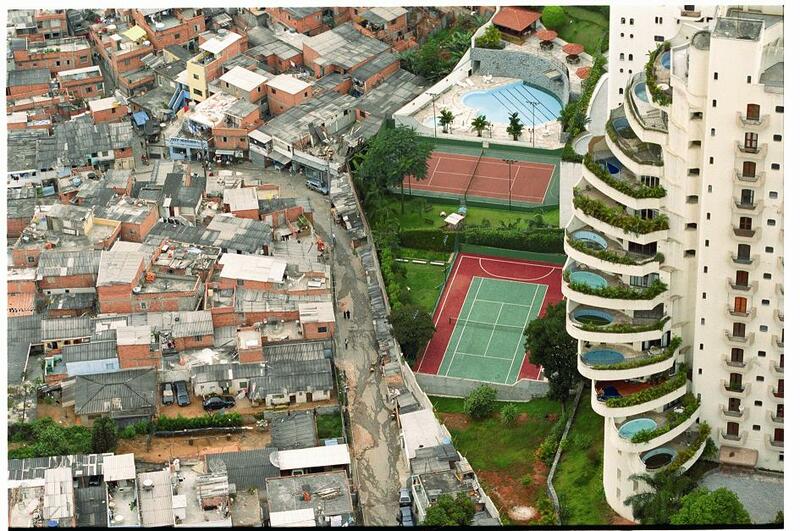 The favela is on the left. The term slum is seen by most, except slum dwellers themselves, as a pejorative term evoking squalor, filth, disease and crime. Slum dwellers, however, often defend their fragile communities in an articulate and powerful fashion, and aggressively organize themselves to secure improved conditions, access to infrastructure (water, sewers, energy), education, and access to some kind of health care. 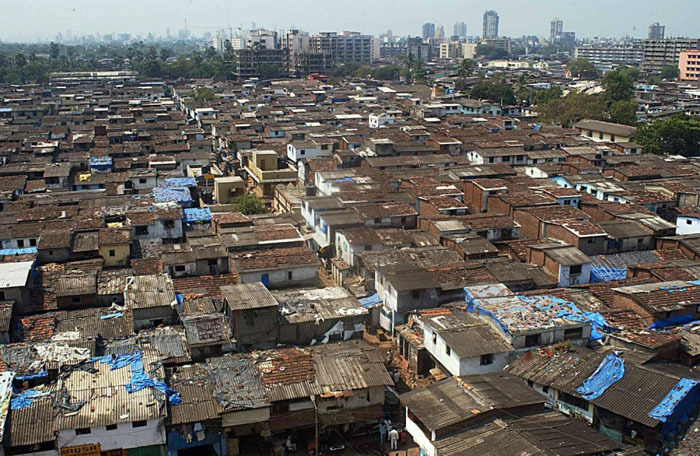 Dharavi, a slum in Mumbai. “A unique characteristic of Dharavi is its very close work-place relationship. Productive activity takes place in nearly every home. 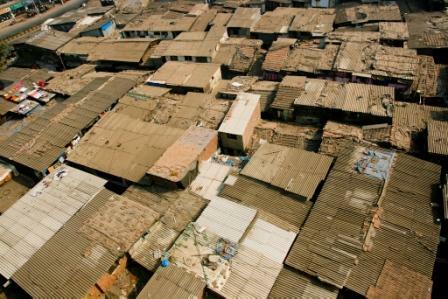 As a result, Dharavi’s economic activity is decentralized, human scaled, home-based, low-tech and labor-intensive. This has created an organic and incrementally developing urban form that is pedestrianized, community-centric, and network-based, with mixed use, high density low-rise streetscapes. 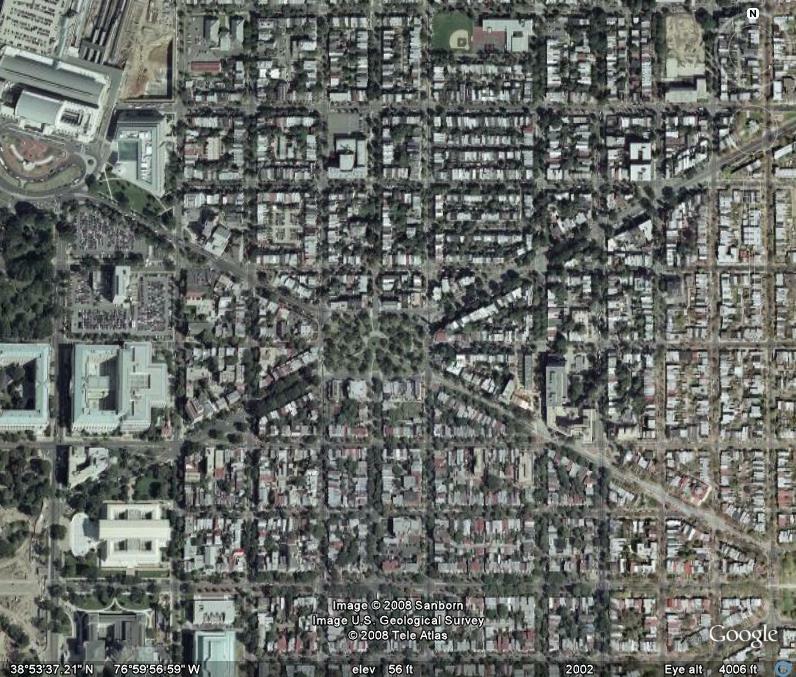 This is a model many planners have been trying to recreate in cities across the world. A simplistic re-zoning and segregating of these activities — common in the United States — would certainly hurt this very unique urban form. -They are not designed by architects, developed by developers, marketed by marketers, or legislated by legislators. -They are participatory, collective efforts. -They are instinctive. They are vernacular. -They are organic and incremental. They change and evolve over time. 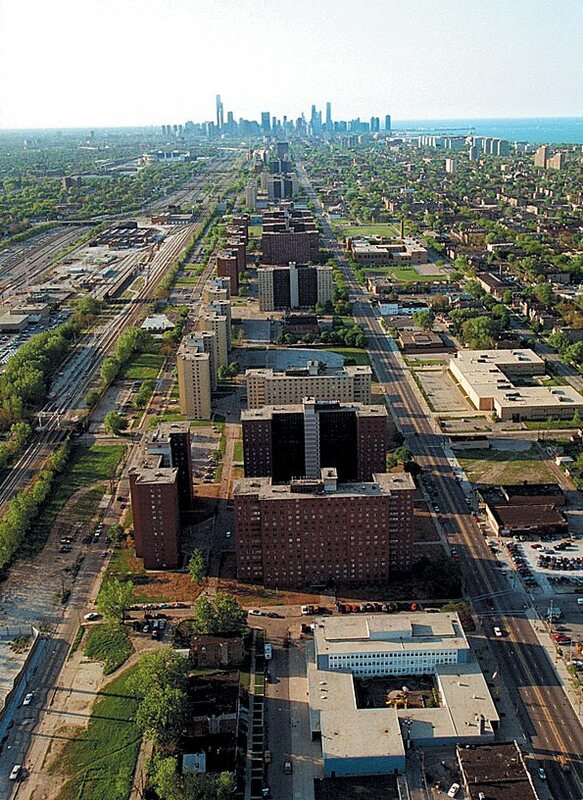 Robert Taylor Homes, Chicago – a paradigm of failed social housing, now razed. -They are spatially and socially complex. -They are very dense, they are definitely not auto-dominated, and they accomodate a dizzying mixture of uses. -They use very little energy, recycle, and have what could be called small carbon footprints. They are constructed of what’s left over. 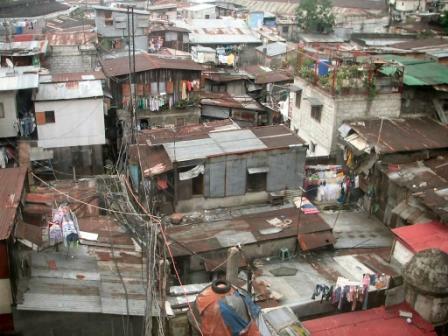 Slums are filled with many very serious problems and unmet needs. But many are also robust and lively communities, highly social, and offer some bit of dignity to those most cultures ignore, or cast out. As physical, designed places, they are inventive and intuitive. Slums are always reshaping themselves, always focusing on creating shelter and shared spaces that deal significantly with local circumstance – how to deal with heat, cold, rain, wind, and work, using what is at hand. We must find our way to the next city in any way we can, as we try to shape a durable, usable urban future. Perhaps the slums of the world can help to show us a way.